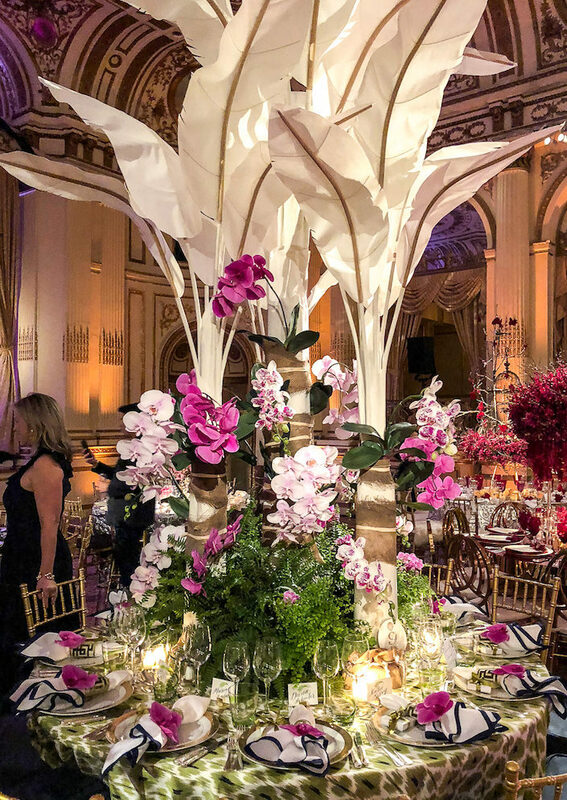 How delightful during the midst of frigid temps and freezing rain to step inside the Plaza Hotel for an evening surrounded by the most glorious table settings enhanced by a profusion of exquisite orchids. 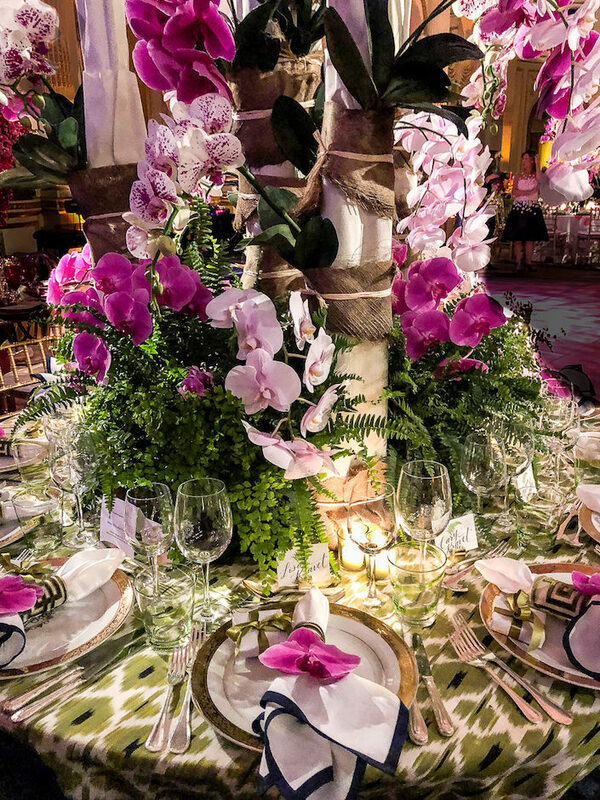 Wednesday evening was the New York Botanical Garden Orchid Dinner 2018, the much anticipated annual event that benefits the Garden’s orchid research collection and orchid preservation. 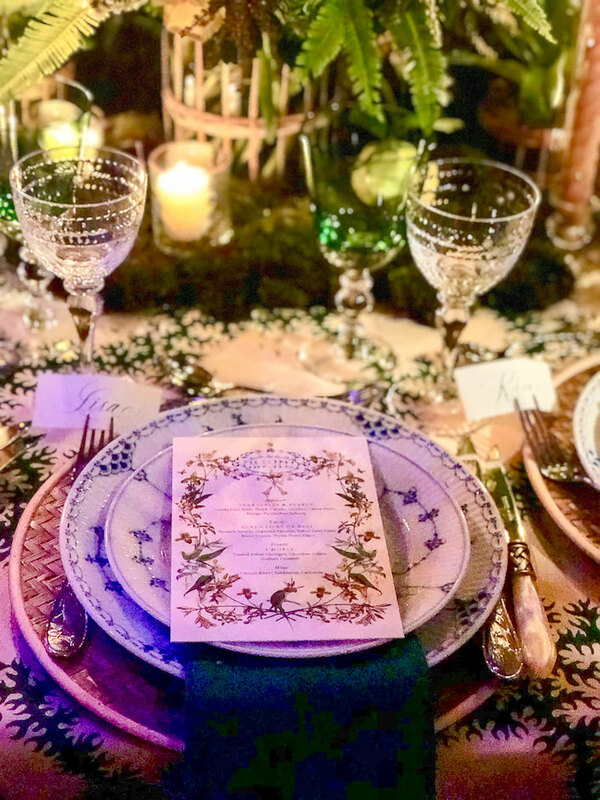 Sponsored by Hearst, VERANDA and Louis XIII cognac, the event was chaired by editor in chief Clinton Smith with Director of Decoration and Special Projects Carolyn Englefield serving as Decorations Chair. 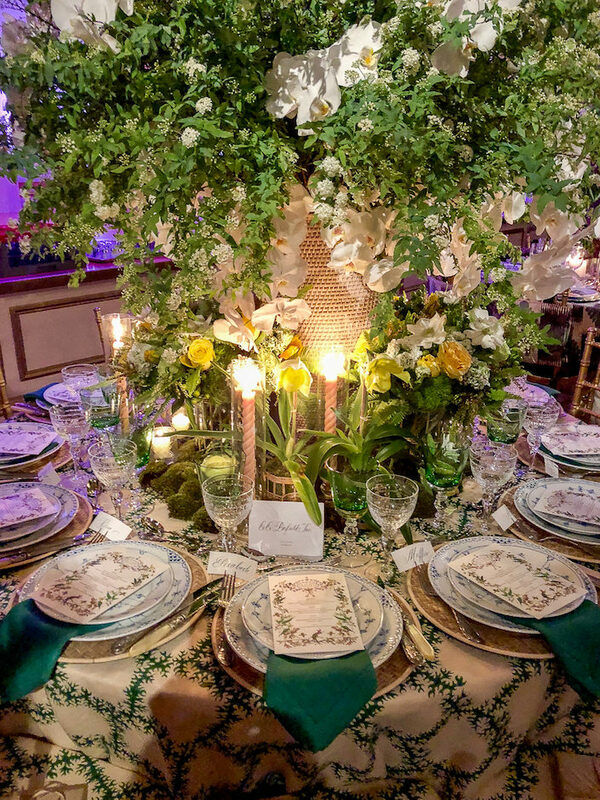 There was a plethora of pretty tables, including CeCe Barfield‘s, below. 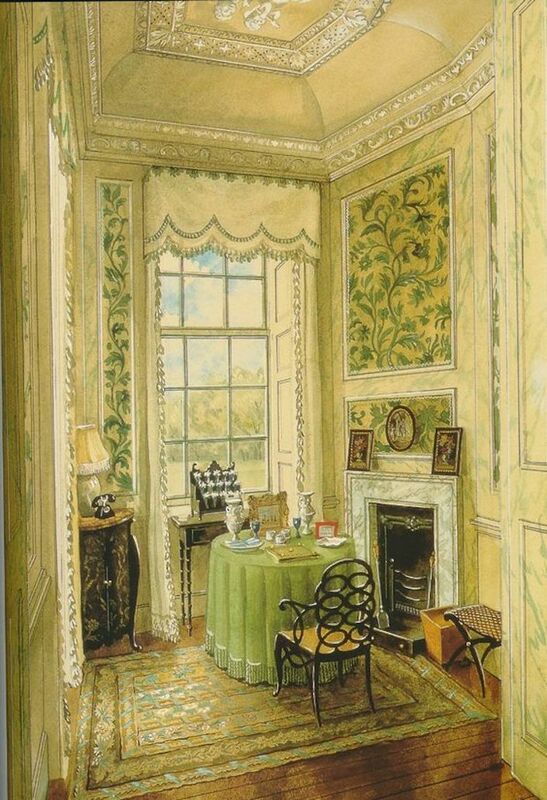 Inspired by Alexandre Serebriakoff’s watercolor of the writing room at Ditchley Park, Cece wanted to capture Nancy Lancaster’s quintessential spirit, perfectly marrying the relaxed with the refined to create a comfortable, elegant and romantic space. 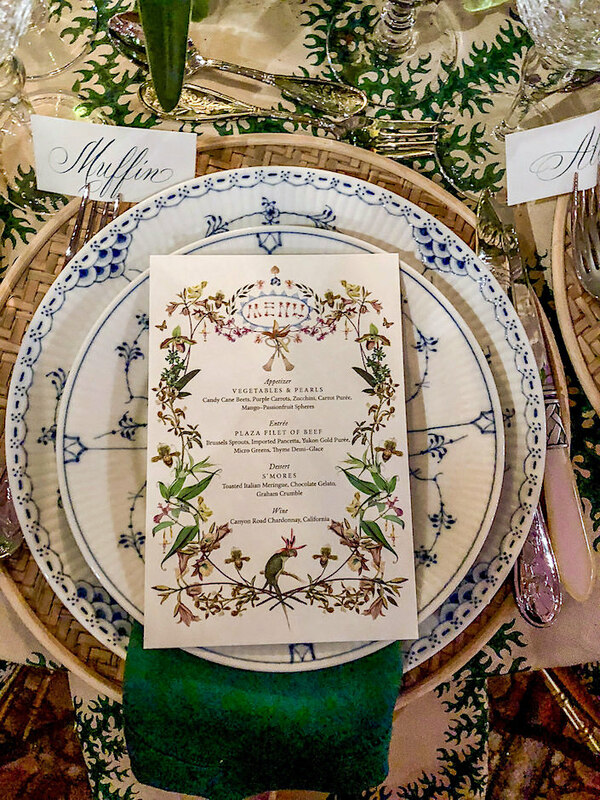 Working with sponsor One Kings Lane, Cece sourced the Royal Copenhagen Plates, the Amanda Lindroth containers, and the Ricci flatware all from the site. 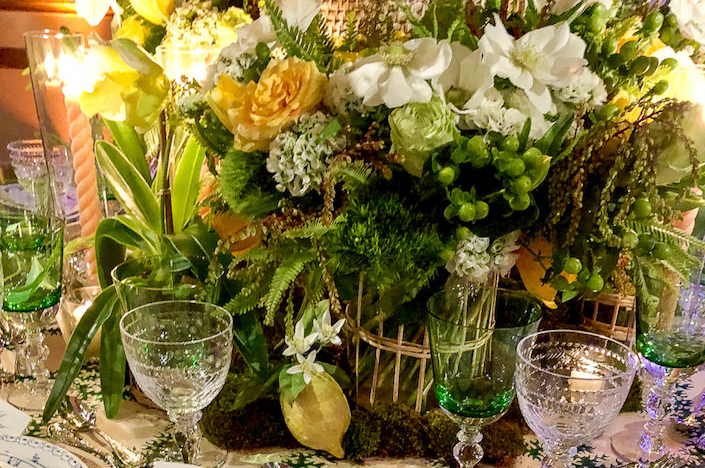 classic stemware from William Yeoward, and the large center urn is from Ballard with blooms by Plaza Flowers. The finishing touch was lemon porcelain tureens, below, created for her by The Vladimir Collection. 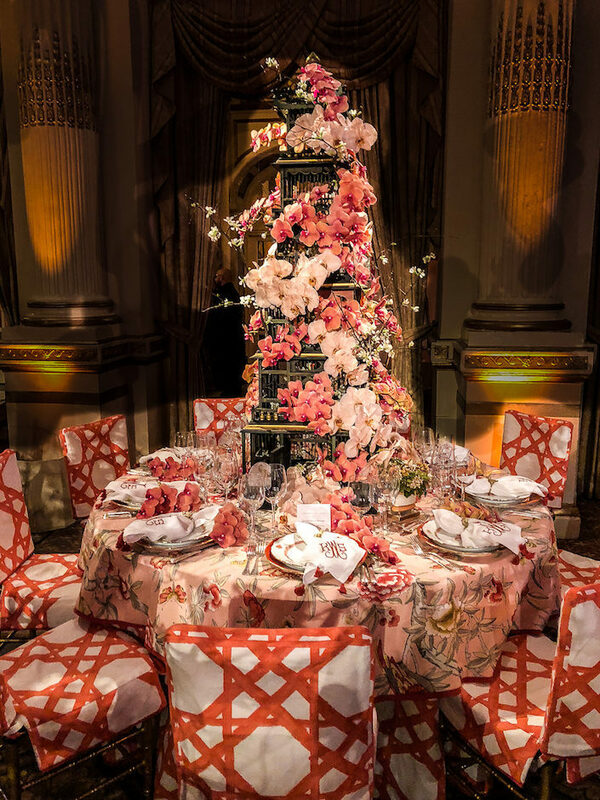 Designer Shelley Johnstone‘s table was inspired by many of the things she loves. Similarly to how she decorates, fills her Design Showroom in Lake Forest, Illinois and lives her life, it is a curated mix. 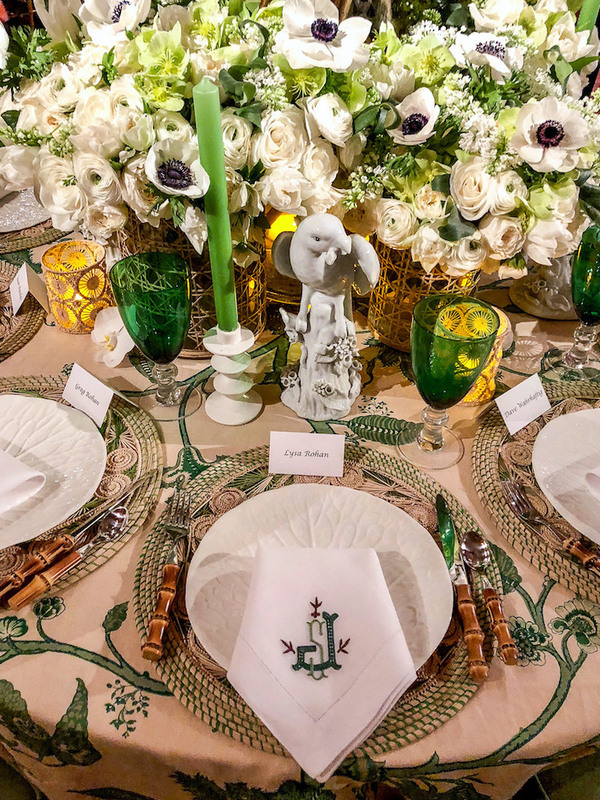 With Soane’s Tendril Vine as the tablecloth, Shelley created a fresh green and white mix including Creel and Gow wicker placemats (which I own and love), rattan containers from Amanda Lindroth, plaster candlesticks from artist Stephen Antonson, Tory Burch white Lettuce Ware from her Dodie Thayer collaboration, and beautiful white blooms from Plaza Flowers. 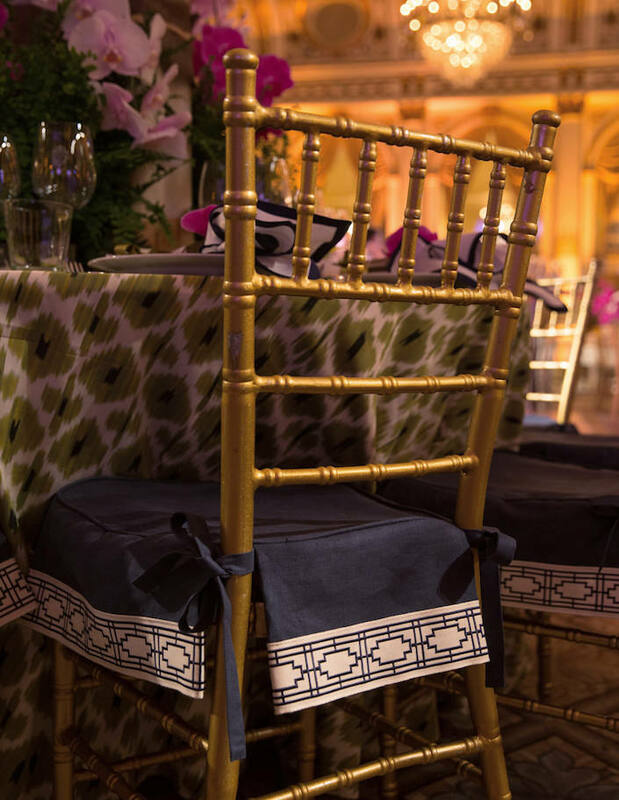 with their embroidered borders on the chair covers. 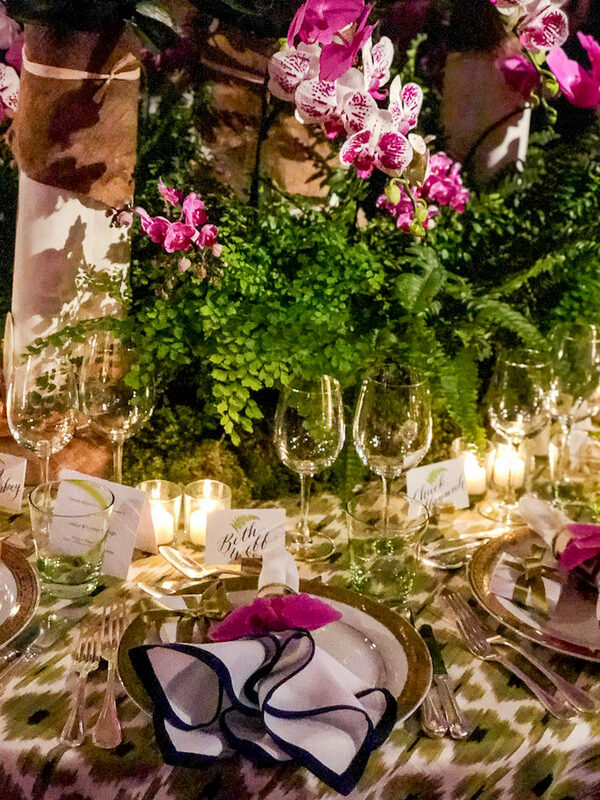 A fresh interpretation echoing Florida’s natural pink and green with charming calligraphy by Rachael Reding on place cards from The Printery! 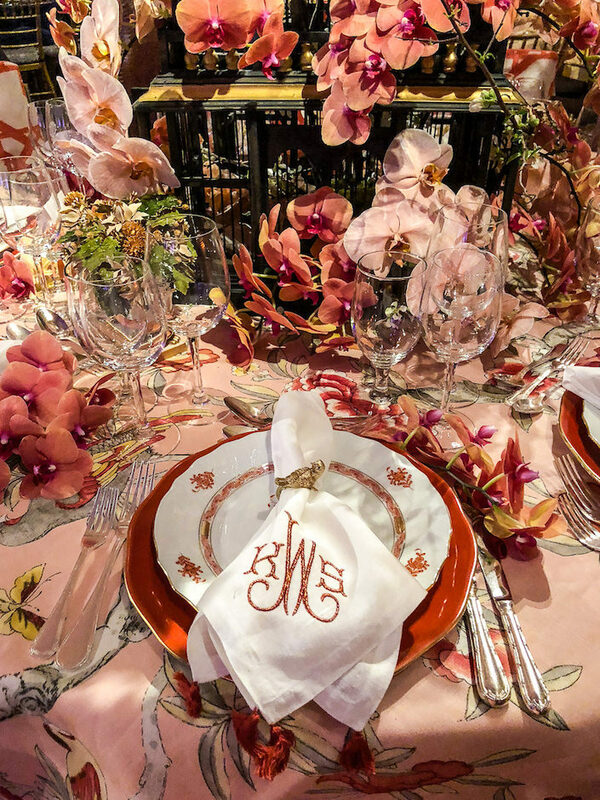 Herend sent her the beautiful china and Kimberly made the tassel rust napkins with metallic threads form Halo Home by KSW. A Major Milestone - One Million Views! This entry posted in Uncategorized. 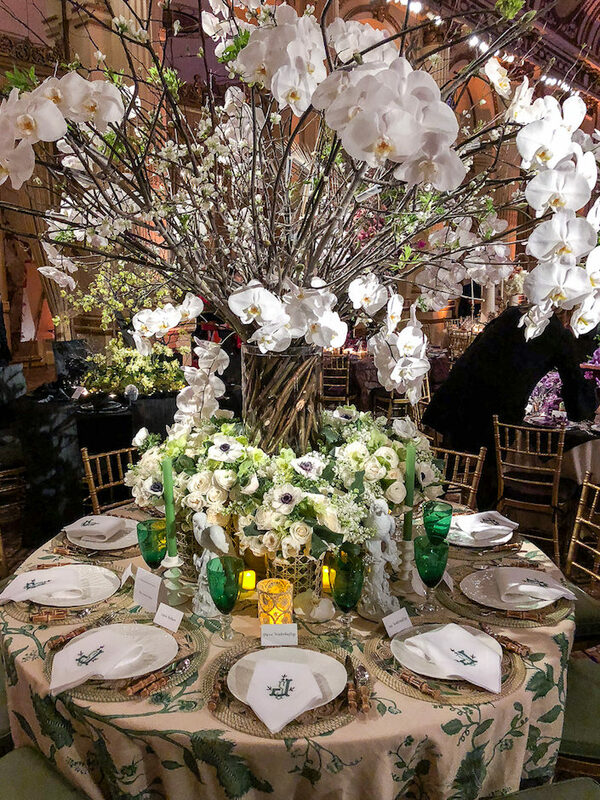 Entry Tags: New York Boranical Garden, NYBG Orchid Dinner, Orchid Dinner, Orchids, talbtop Bookmark the permalink. Oh! To be there amid such glorious settings — I’m coveting everything! (And making copious notes.) Thank you for sharing. This is all so lush and lovely , thank you for bringing some color and warmth into this grey and cold weather ! 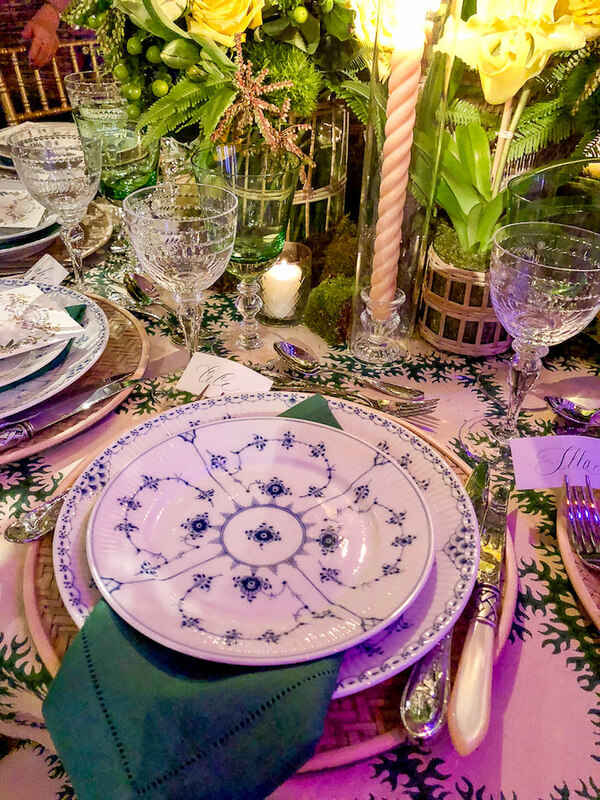 By any chance, do you know who makes the gorgeous emerald green wine glasses on Shelley Johnstone’s Green and white table? They just sing “garden” with elegance next to the bamboo flatware ,and the cane containers. from the natural world… the whole effect is wonderful. All the tables are wonderful! Ohhh!! 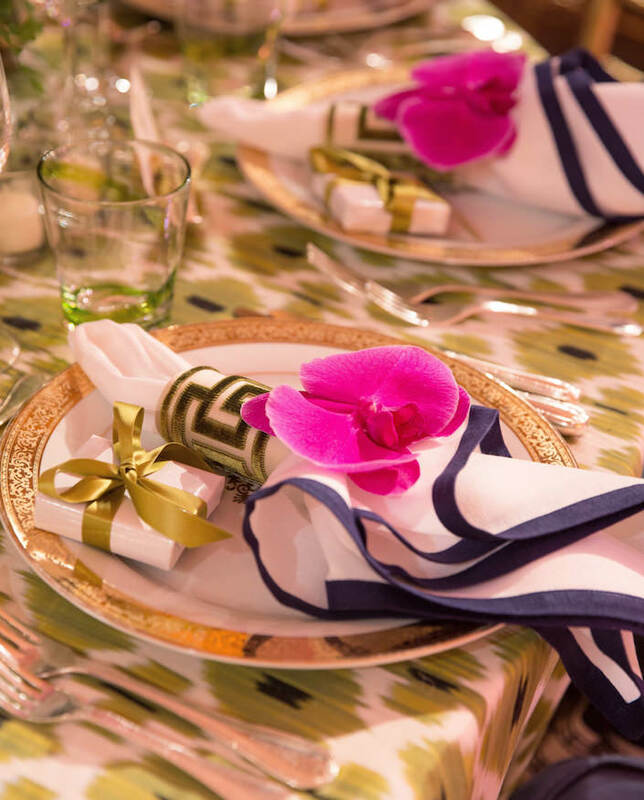 !All the tables and everything you’ve shown us are looking soooo grand…!!! Thank youso much for sharing.. I guess restraint isn’t the name of the game! 79 queries in 0.626 seconds.